The Coalition Government's strong action to shore up domestic gas supplies has contributed to a positive outlook for the gas market in the latest Australian Competition and Consumer Commission Gas Inquiry report. The Treasurer directed the ACCC to conduct a three year inquiry into the wholesale gas market in Australia in April 2017, with interim reports to be produced no less than every six months. The Government is today releasing the fourth interim report of the inquiry. The ACCC initiative is part of our plan to reduce energy costs for Australian businesses, to ensure they can become more competitive. This forms part of our broader plan for a stronger economy, which includes more competitive taxes, open trading arrangements, medical and defence industry plans, and ensuring the government lives within its means. The ACCC finds that there has been a significant improvement in gas market conditions on the east coast since their first report in September last year, at which time it was forecast there would be a gas shortfall in 2018. It is now forecast that Australia will not experience a gas shortfall in 2018 or 2019. The ACCC's findings are based on improved gas production, particularly in Commonwealth waters off Victoria, the construction of the Northern Gas Pipeline connecting the Northern Territory (NT) to the east coast, and a decline in demand for gas for electricity generation. It is encouraging to see market conditions continuing to improve, particularly for domestic gas users, and this is due in large part to the Coalition Government's leadership and action on energy policy. The Heads of Agreement with LNG Exporters signed last year and the Australian Domestic Gas Security Mechanism have been pivotal in securing gas supplies for the domestic market. The ACCC notes that the Heads of Agreement in particular is clearly influencing decisions by these producers to supply gas to domestic consumers. 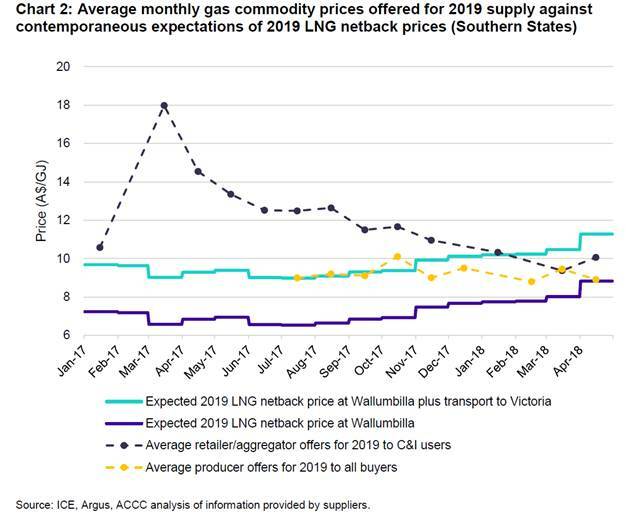 As a result, the number of offers for gas supply to commercial and industrial users has increased, while prices offered have fallen by 50 to 60 per cent since their peak in March 2017, from $22/GJ to $8-11/GJ. While this is good news, risks remain. In particular, the ACCC notes that the amount of gas demanded for electricity generation can be volatile and difficult to forecast. This is particularly an issue for the outlook in the Southern States, where the closure of the Northern Power Station in South Australia and Hazelwood Power Station in Victoria led to an increase in the importance of gas for electricity generation. The ACCC continues to advocate for gas supply, particularly in the Southern States where the supply-demand balance is tight. The report urges state governments to remove blanket moratoria and regulatory restrictions and instead adopt policies that consider and manage the risks of individual projects. The ACCC's work suggests that gas prices in the Southern States could be $2-4/GJ lower if more gas is produced in those states, rather than needing to be transported from Queensland. 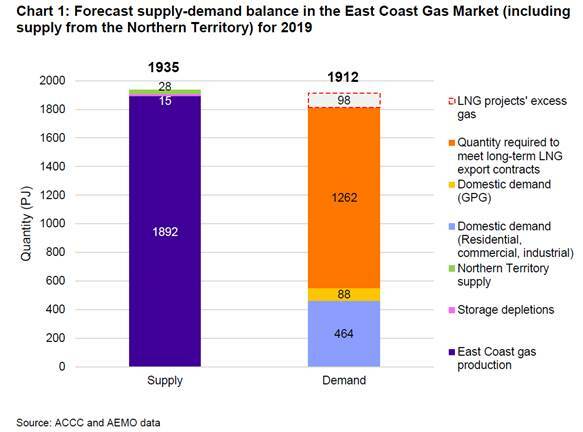 The lifting of moratoria on fracking in the NT could see supply from the NT into the east coast market increase significantly over the coming years. The construction of the Northern Gas Pipeline from the NT is expected to provide an additional 28 PJ of gas to the market in 2019. The Coalition Government is doing its fair share to support gas development and strongly encourages all states to do their part to secure affordable gas for all Australians.